Light Sound Meditate is an interactive kinetic, light and sound sculpture. Audiences are provided with torches, used to shine light onto one of eight speakers in front of the work. Small light sensors pickup the intensity of the light causing new and unexpected sounds to be created using a Tibetan singing bowl. Singing bowls are used in many cultures for relaxation, mediation and good health. 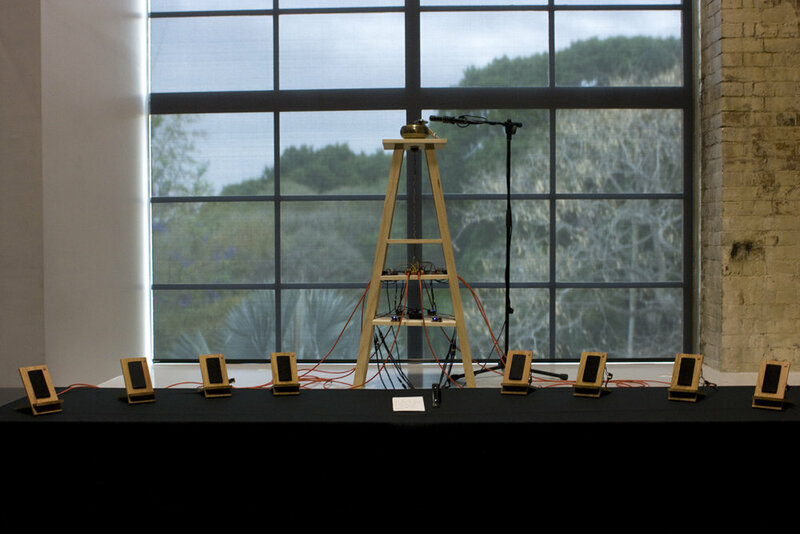 This installation challenges audiences to find a sound within the sound that relaxes them. Small shifts in light intensity and opposition from other participants using other torches can easily break the state achieved by another participant. These shifts create screeching, modulating and other intense soundscapes, that are analogues of the original sound. This work was presented in October 2012 during the Restrung Festival at the Brisbane Powerhouse. Built using a Tibetan singing bowl, microphone, arduino, custom electronics, light sensors, MaxMSP, light sensors, stepper motor, class D amplifiers, speakers and a Mac Mini.